Productivity is a hot topic for a reason - who doesn't need more hours in the day? Especially for business owners and executives, time comes at a high cost, and the wasted time can lead to the demise of an organization. However, many "productivity hacks" take a lot of time to implement. Today, we wanted to focus on getting the quick wins in that will start saving you time today. 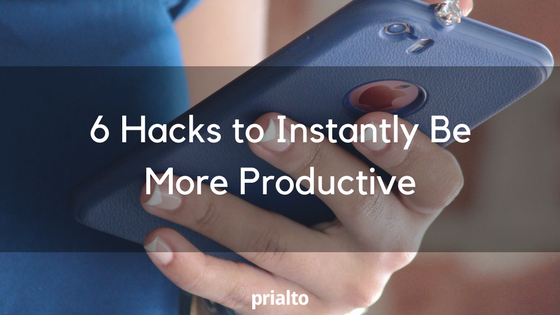 Check out these 6 hacks to instantly be more productive, and start taking your time back today. Most people realize their calendar is an asset for keeping their schedule on track. But it can also be a productivity killer, especially if you work in an environment where you are expected to share your calendarr or if your colleagues can request your time by scheduling directly to your calendar. Take control of your calendar by using the technique of time blocking. Do you know that you need a few uninterrupted hours to work on a project? Schedule it in a meeting with yourself. Then you know you’ve set aside the time you need to return phone calls, send e-mails, or plan your week. Every sound, banner, and badge you glance at on your phone comes with the exchange of your time. Even if you don’t actively interact with the notification, the distraction can still cost you. "Cellular phone notifications alone significantly disrupt performance on an attention-demanding task, even when participants do not directly interact with a mobile device during the task," said researchers in a 2015 study conducted at Florida State University. The researchers found that the distractions not only cost the subjects’ time, but also resulted in more mistakes. Turn off notifications or put your phone in do not disturb mode while you’re working. Though they won’t block notifications, you can also use focus-enhancing apps, such as Flora or Moment to help you break the tech addiction. 52% of people admit to checking their phones first thing in the morning. That can get you into work mode and have you checking your e-mail before you’ve had that all-too-important first cup of coffee. Checking e-mail early and frequently throughout the day leaves you at risk for prioritizing the needs of others before what you’ve already planned for yourself that day. If you’re constantly responding to emergencies and putting out fires that come through in your inbox, you’ll never get to your to-do list. Schedule time on your calendar to read and respond to e-mail. Then, your priorities remain intact, and you’re still taking time to respond to your colleagues and clients in a timely fashion. Check out more of our tips on how to control the urge to put e-mail first here. The Pomodoro Technique can be a real life-saver if you’re prone to distraction. Named for the tomato-shaped timer used by the inventor of the technique, it amounts to this: you set a timer for 25 minutes and work consistently through that time. Once your timer goes off, it’s then time for a 5-minute rest period. Once you’ve completed 4 cycles, you take a slightly longer break, of 15-30 minutes. This technique is extremely effective, because it balances extreme focus with the reward of a break. Don’t believe it? Give it a try when you’re done reading this article. A good to-do-list is a thing of beauty. You should know when and how you’re planning to accomplish your tasks, otherwise they are never going to get done. Writing it down makes your goals and deadlines more tangible and more real. One mistake to avoid, however, is to tell others about your goals – because our brains confuse the talking about doing with the actual doing. Keeping written records is good for helping us focus, and doesn’t it feel good to cross something off the list? There are times when busy sales professionals have more on their plates than they could ever possibly handle. Trying to take it all on and maintain your focus on the most important things leaves you with a lot of things undone. One way to break the cycle is to recruit help. Free up time by delegating tasks to a virtual assistant, so that you can stay focused on the tasks that you’re best at and that will bring in the most revenue. Prialto virtual assistants can take on your repeatable, time-consuming tasks without needing the extensive training of hiring your own assistant. Try a few of these productivity hacks to get a few hours back in your week!